I got this cute box at TJ Maxx a few months ago. 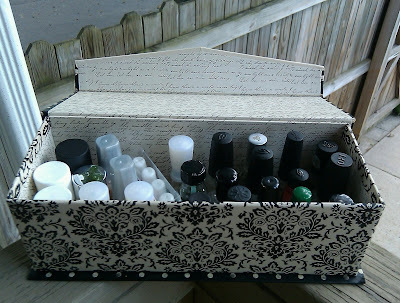 I believe its original intent was for stationary storage, but it is the perfect size for nail polish, all the bottles I use fit in it perfectly, even the taller ones. I don't like putting my topcoats in my helmer, I like to keep them in something I can pick up and walk around in. I can fit 27 polishes in this box, which is pretty good for how cute it is! I use this for the topcoats/basecoats/treatments that are not currently in rotation. 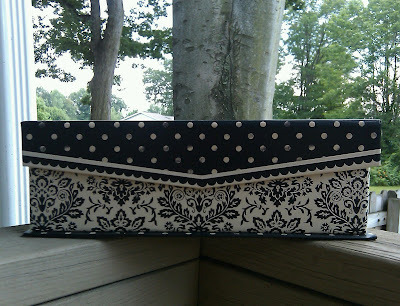 I have another storage system I use for my current products, which I will show you later in the week. Do you have any cute storage solutions? I would love to hear about them!